Since 1960, over 325,000 Cuban medical personnel have worked in 158 countries around the globe. They have attended 2.6 million births, conducted 9.1 million surgeries, administered 12.8 million vaccinations, saved an estimated 5.7 million lives, and trained over 50,000 international medical students from rural, poor, and marginalised regions. Significantly, many of these international programes have been instituted in countries openly hostile to Cuba, from Somoza’s Nicaragua, via Pinochet’s Chile, to George W. Bush’s United States. To date, Cuban medical internationalism has been nominated for the Nobel Peace Prize three times, as the Cuban government continues to provide professionals in both medical care and medical training to some of the world’s most vulnerable populations. Despite this contribution to global health, Cuba’s international medical efforts have faced some difficult issues. Chief amongst these issues is a clear pattern of protest facing Cuban health workers in many of the developing countries where they work. They have been called “Castro’s slaves”, “monkeys”, and “incompetent”. Thousands of doctors and medical-association members have vehemently – and sometimes violently – protested against the inclusion of Cuban professionals in their country’s and medical systems. Today, there are some 55,000 Cubans working in 67 countries, including more than 25,000 medical doctors. Many have faced protest and prejudice for their work. Yet, research suggests that these protests follow a very similar 2-3 year pattern that tends to culminate in acceptance of – if not respect for – these Cuban professionals. This has been the case in Brazil, Bolivia, and Haiti. The only clear exception has been Venezuela under Chávez and Maduro, where Cuban medical personnel have been heavily politicised. There are two steps to the pattern of protest facing international Cuban health care. The first step involves domestic medical federations, often including private medical personnel, that formally petition their governments not to allow Cuban medical professionals into their country. This step occurs during the negotiation process between the host government and the Cuban government, as issues such as the quantity and roles of Cuban personnel are formalised into a cooperation plan. As the results of the negotiations become public, domestic medical federations and private practitioners become increasingly active in their formal demands. The second step involves medical federations using the media to increase the publicity of their protests. The media is used to communicate the view that Cuban personnel are poorly trained, steal jobs from local doctors,, lack necessary documents and certifications to practice medicine in the host country, and may actually harm patients as a result of their inexperience and ineptitude. This step usually occurs as the arrival date nears and can continue for the first few years that Cuban medical teams are at work in the country. While these protests are problematic for Cuban workers, the responses of domestic medical professionals are not necessarily “bad” or “wrong”, as many are simply defending the perceived high standard of domestic healthcare. The Cuban system – based on a preventative rather than a curative approach – often appears odd when compared to other medical systems, and as such can easily be viewed as overly basic by doctors trained to use advanced technology. Following the initial media push and criticisms against Cuban workers, the focus of the media and domestic protesters shifts towards advocating for the human rights of Cuban medical professionals, who are commonly described as “slaves”. In particular, domestic medical personnel use the media to demonstrate that the Cubans work and live in extremely poor and highly dangerous areas. While these domestic workers protest for the rights of Cubans, it is notable that they do not protest against the living conditions of the poor, rural, and marginalised local populations that benefit from the care of the Cuban contingent. In the case of Bolivia, which hosted 600 Cuban medical personnel, domestic medical associations held large protests, including in 2006 a 24-hour protest orchestrated by the leader of the 15,000-strong medical association, Fernando Arandia. 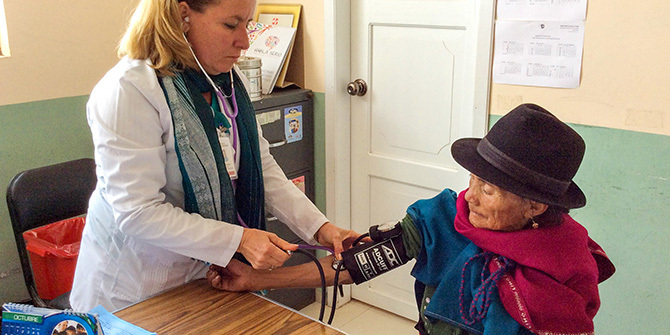 The president of the Medical College of La Paz argued that “‘a fundamental social pillar such as the health of a people’ should not be left in the hands of foreigners”. In Brazil, medical groups also vehemently protested against Cuban doctors arriving through the Mais Médicos (More Doctors) programme, which by 2014 had 11,400 Cubans working in some of the country’s most underserved areas – some had never before seen a doctor. 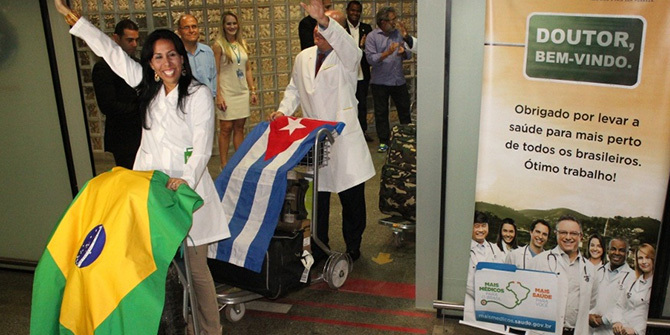 These Cuban healthcare teams provided medical care to some 46 million Brazilians. The Haitian case follows the same pattern. Cubans arrived in 1998, following the devastation of Hurricane Georges, and have been providing healthcare across the county ever since. Cubans have provided approximately 75 per cent of rural health care, as well as training over 1,000 Haitian doctors at the University of Medical Sciences in Santiago de Cuba (known colloquially as “the Caribbean Faculty”) at no cost to the students or the Haitian government. Yet here as elsewhere, protests were commonplace. Haiti’s few doctors, nearly all of whom were located in the capital Port-au-Prince, still saw Cuban doctors as a threat. But as elsewhere, the usual pattern played out within two or three years, with almost all opposition collapsing as acceptance and respect for the Cubans’ efforts increased dramatically. The Venezuelan case is more complex. Cuban medical internationalism has always sought to maintain a neutral political position, partially to remain medically inclusive, as their primary aim is to provide badly needed health care to the poorest and most marginalised, irrespective of their politics. Though the Cubans participating in the Venezuelan programme Barrio Adentro (the Into-the-Neighbourhood Mission) again tried not to get involved in local or national politics, they ultimately suffered from and added to the extreme polarisation of the country’s politics. Essentially, Barrio Adentro has become synonymous with Nicolás Maduro and Hugo Chávez, with their portraits appearing alongside those of the heroes of the Cuban Revolution throughout its network of clinics and hospitals. Rather than reinforcing political neutrality to remain accessible to people of all ideologies, Barrio Adentro has been symbolically aligned with the Chavista government and the wider United Socialist Party of Venezuela. This has implicated Cuban workers in the intensification of the already significant divisions amongst Venezuelans. Thus, during the 2015 National Assembly election in Venezuela, it was commonplace to come across slogans and signs instructing citizens to “say ‘no’ to Cubanisation [of Venezuela]!”, particularly in wealthier areas of Caracas. At a practical level, this has translated into Cuban medical staff being at once lionised and victimised within a highly tense and often violent sociopolitical situation. The future of Barrio Adentro has also been rendered uncertain by the declining popularity and dwindling resources of the Chavista government. Overall, no matter how vociferous protests initially appear, they typically end within a few years as levels of acceptance and respect for Cuban efforts rise. As for Venezuela, Cuban medical professionals continue to attempt to provide medical care within an extremely divided nation, but their experience provides a valuable lesson about the importance of remaining politically neutral if medical services are to reach the widest possible range of underserved and marginalised areas. From Cuba’s perspective, these internationalist missions have also proved fruitful, as the country has continued to develop improved diplomatic relations with countries that once condemned Cuba’s Revolution. Today, every country in the Americas except the United States votes at the UN in favour of ending the US embargo on Cuba. This result would be highly unlikely without the the efforts of the remarkable number of Cuban medical professionals willing to work in some of the most difficult and medically vulnerable areas of the world. Dr Emily J. Kirk is Postdoctoral Fellow in the Department of International Development at Dalhousie University. Her research focuses on global health, Latin American development, and south-south cooperation. She is the author of Cuba’s Gay Revolution: Normalizing Sexual Diversity Through a Health-Based Approach (Lexington Books, 2017) and co-editor of Cuba’s Forgotten Decade: How the 1970s Shaped the Revolution (Lexington Books, 2018). Chris Walker is a Canadian Institute of Health Research (CIHR) Fellow and Doctoral Candidate in the Department of International Development Studies at Saint Mary’s University, Canada. He has published widely on Cuban Medical Internationalism and is the author of Venezuela’s Health Care Revolution (Fernwood Publishing, 2015). Dr Arturo Méndez is Professor of Medical Sciences at the University of Camagüey, Cuba. In addition to his diverse research profile, he is responsible for the Post Graduate courses regarding biomedical sciences, Chairman of the university’s academic committee of Public Health, and Secretary of the provincial scientific council of the health sector. These opposition movements are instigated by organizing and direction from the US Embassies in the countries mentioned and others. They also have implemented a proven the professional medical parole program that tries to entice medical staff to abandon the poor in return for false monetary promises of better jobs in the US. Sadly, this is not quite true. Israel tends to vote in lock-step with the U.S. to support the embargo. And sometimes other major world powers — er, tiny Pacific island states that are U.S. vassals — do also. Response to previous comment. Israel and the Islands mentioned are not in the Americas so the original statement is correct but your sentiment is well taken.